Xerotigana (pr. Ksae-roh-TEE–gha-na), is a simple Cypriot recipe, made in two ways: one with flour, baking powder, salt and water to make a thick batter or using yeast. They are then fried and served with sugar, honey or other syrups, such as leftover syrups from fruit presereves (glyka tou koutaliou) but can also be served with petimezi or haroupomelo. I made my tweak on this traditional recipe by adding grated fresh ginger and couverture chocolate which I cut into small cubes, which I covered with the batter and fried. On top I drizzled lots of delicious Greek thyme honey. They must not be confused with Cretan “xerotigana”, which are totally different. Cypriot xerotigana are similar to Greek loukoumades but easier to make. I used fresh yeast to make the batter but you can also use dried instant yeast (8 – 9 grams instant yeast to 500 grams flour). Actually yesterday when I was preparing a yeasted dough to prepare something for dinner, my son said that he would love some loukoumades, but I had so many other things to do that I did not have the time, so he compromised for these xerotigana, which were equally delicious. Coincidentally, xerotigana are made today, on Epiphany day, to feed “Kalikantzari” who, according to our folklore traditions, are like goblins who live deep down in the earth and cut down the trunk of the tree which holds the earth. They come up on earth during the 12 days of the Christmas period and make all sorts of tricks to the people. You you can read more about Epiphany and Kalikantzari in a previous post of mine. I can’t tell you the exact recipe as I made the first part by using 35 grams of fresh yeast, a tablespoon brown sugar, about half cup all-purpose flour and a cup of tepid water, which I mixed to dissolve the yeast and then left it to bubble. I then separated this mixture and used 2/3 of the mixture to make the dough, by adding more flour, olive oil, salt and water. I did the same for xerotigana by adding more flour but without using olive oil. The mixture was left to the consistency of thick batter. To fry them, it is better to use either a light flavoured olive oil or any other vegetable oil which has a high smoke point. A tablespoon of batter will make xerotigana about 5 – 6 cm wide. If you want them smaller, add a teaspoon batter. Today I was making dough for pizza and since I did not have anything for dessert I remembered xerotigana. This time my experiment was with apple slices, orange, zest, cinnamon and honey. (It was very cold, today so, in order to help the batter rise, I put the bowl over a pot with hot water and I covered the pot with a napkin). From the above recipe, the three ingredients in red should be substituted with more orange zest (1 – 2 tbsp), less ginger (1/2 tsp), no chocolate, 1/4 tsp cinnamon and 2 apples, peeled and cored, cut into 1 cm slices. When fried drizzle lots of honey and cinnamon on top. This year in the batter I added bananas sliced into 1/2 cm slices. 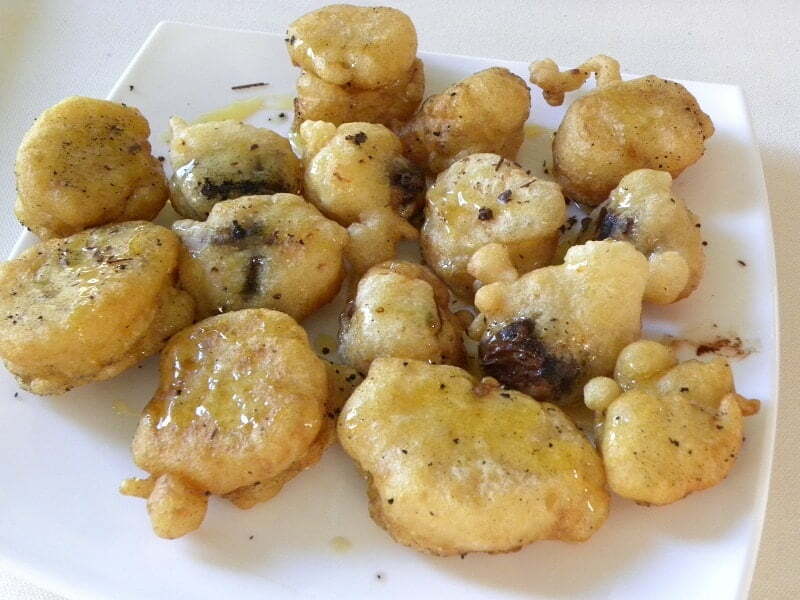 I used a teaspon as a measurement, in which I took a slice of banana with the batter and I fried them in olive oil. I served them the classic way with honey and more cinnamon on top, although drizzling some chocolate ganache on top, passed my mind while frying them. However, unfortunately I did not have the ingredients at the time of making them. The slice of banana was not visible inside when fried as it melted but all the taste was there. From the previous recipe I reserved 1 cup of batter in which I crumbled some feta and mixed some paprika. The batter can make fritters but I preferred to bake them in the oven. It makes a wonderful “mezedaki” or appetizer. Preheat oven to 180o C / 350oF. Crumble feta and mix all the ingredients together to make a thicker batter. Line a baking tin with parchment paper and add a heaped tablespoon of batter, spaced apart. Bake for 30 – 35 minutes or until golden on top. Xerotigana (pr. Ksae -roh -TEE - gha - na), is a simple recipe, made with flour, baking powder, salt and water to make a thick batter and then fried. They are served with sugar, honey or other syrups, such as leftover syrups from fruit presereves (glyka tou koutaliou) but can also be served with petimezi or haroupomelo. Dissolve the yeast with 1/2 cup lukewarm water, sugar and a couple tablespoons flour. Cover and set aside until it bubbles. Add all the ingredients (except chocolate and ginger) in a bowl and add the water gradually until you have a thick batter. Cover and set aside until it doubles in volume. Mix in the chocolate and ginger. Heat the olive oil in a deep frying pan or pot so that it is about 3 - 4 cm high. Take a tablespoon batter with one piece of chocolate in it and pour it in the oil. After several additions, dip your spoon in the extra oil so that the batter slips easily away. Remove to a platter and add lots of honey on top as well as any leftover chocolate shavings/pieces. Previous Post: « Happy New Year, with a glimpse in the future!! Oh I love them. In Lebanon we do the same on the Eve of Epiphany! Cherine, may be it is on the eve of Epiphany. It's been so many years I have left Cyprus that I couldn't remember if it was on the eve or on Epiphany day this was done. I ask ask or google search it to see if I find any information and shall correct the post. a happy new year and all the best for you and yours,ivy!xerotigana is "first sight" for me,sounds very interesting,very flavored! I love all these treats. Xerotigana and loukoumades as I told you before. I can eat as many as to blow. I dont bother to grab some and munch rite now ..yummy fritters.. Interesting and so delicious sounding! A wonderful treat. This look like a delicious snack to serve. I love your xerotigana Ivy. I have to try them with the chocolate and ginger. My mom makes tiganites, are those the same things as xerotigana? She uses the loukamades dough (or something very similar to it) and will make either coils or flat pancake like shapes and fry them lightly in a pan as opposed to balls of dough in a deep fryer like we do with loukamades. I love her tiganites. But adding chocolate… hmmmm…. NEVER thought of that. How delicious must that be! My recent post Happy New Year!!! Niki, actually tiganites are similar to pancakes with eggs and milk. There are various kinds of xerotigana, depending on what part of Greece you are from. In Cyprus for example they are made with either yeast or with just baking powder. I think what your mum makes is actually xerotigana and not tiganites. Interesting… We’ve been calling it that for so long b/c that’s what yiayia called it. I would love to find a recipe to tiganites now and compare!!! Do you have one by chance? This is a very interesting recipe, Ivy. Deep fried treats dressed with honey can be found in Italy too. Ooo, these sound so yummy, I need to make them for 5 Star Foodie Jr. ! Oh wow! I love the combination here of chocolate and ginger! Nice twist…keep them coming! Oh these look sinfully good. Fried dough drizzled with honey….lovely. What a great take on xerotigana! Now I want to make these or loukoumades tomorrow, only that will go against my whole eating healthier goal! I had been feeling guilty as I completely forgot this tradition of making fritters for Epiphany! Oh well, it will be a few days late, as it is every year. My grandmother made the best fritters, tiny as marbles, perfectly shaped and shiny with syrup. I cant make them as nice as hers; love your idea to add some flavoring to yours, chocolate and ginger is a great combo. Interesting… We’ve been calling it that for so long b/c that’s what yiayia called it. Oh I love them.